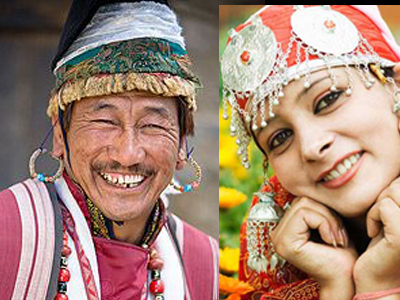 The Culture of Jammu and Kashmir can be termed to be as rich as is the heritage of the state.It is a comprehensive mingling of three distinct regions Kashmir, Jammu and Ladakh.There is a wealth of ancient language, literature, art, craft and music in the state. Its culture is a blend of Buddhist, Hindu and Muslim cultures. Apart from variations in demographics cultural diversions of its elements make the state a truly remarkable phenomenon. Music, dance, cuisine, lifestyle, festivals all these only highlight the diversities prevalent in these provinces but at same time exist in perfect harmony with each other. 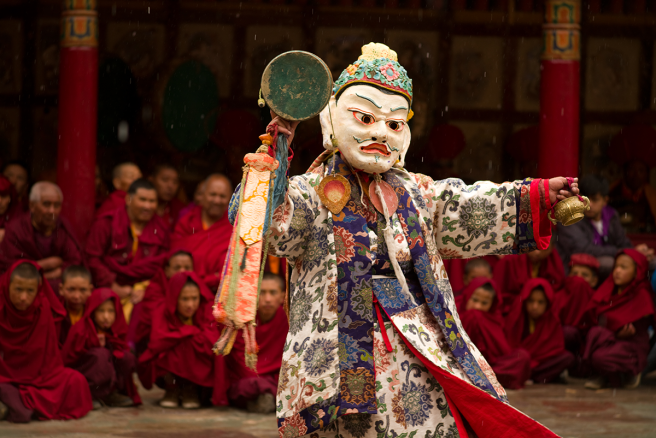 The mask dance is a popular danceform that is vividly performed in the Hemis monastery in Ladakh. It is known to represent the Mahayana Buddhist tradition of the victory of good over evil. 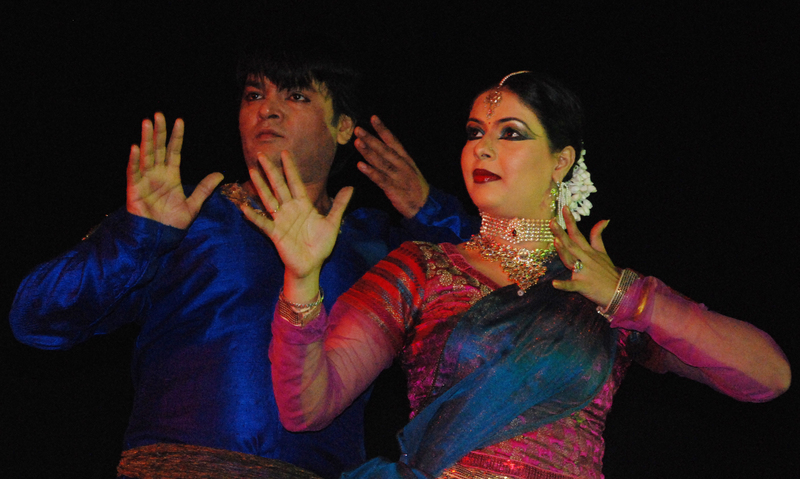 Hafiza dance is another popular dance which can be seen especially a a o lot of weddings. Bacha is danceform which is performed during harvest season by the young boys. Ruf and Wuegi-Nachan are popular folk dances of the state. Dogri and Roul are the folk dances that are performed by the women. The most popular Kashmiri folk music is Rabab. Popular folk instruments are sitar, dukra and nagara. Rabab is one of the many popular styles of folk music in Kashmir. Some of the frequently used musical instruments are the nagara, dukra and sitar. Another salient instrument that is an integral part of the music is the santoor. It is the famous musical instrument of one hundred strings beat with sticks. Hafiz Nagma is grounded on the classical music of Kashmir- the Sofiyiana Kalam. The danseuse is called `Hafiza`. The salient instrument employed in Hafiz Nagma is the Santoor. Songs of Habab Khatun too are composed depicting the sadness of the famous Kashmiri princess of the same name. The pilgrimage centres like the one at Hari Parbat where monuments of all three religions with a temple, mosque and gurudwara co-exist, are the living signs of the communal harmony of the people of the State. The people of Jammu and kashmir all get together celebrate and enjoy festivals like Durga Puja, Eid-ul-Zuha, Holi and Diwali with same fervor and enthusiasm. Even though the state as of late has been suffered from terrorist atrocities over the years the spirit of the kashmiri people has always been warm and friendly. The men and women have interesting clothing styles here in Jammu and Kashmir. While the men wear skullcaps, shalwars, churidar pyjamas, and gurgabi (lace less shoes), the women look pretty in their long colourful dresses with several ornaments like earrings, necklaces, bangles and nose rings. You will notice a common woolen outfit in J & K that is decorated with floral motifs and heavy embroidery. It is called Phiran. Kashmiris are big love non-vegetarian particularly those made from meat and lamb. Polao is a favourite among Kashmiri veggies. Some of the very famous dishes of the Kasmiri cuisine includes ( Rista), Minced lamb patties( Shami kabab), Lamb koftas( Kashmiri Gustaba), spicy lamb steaks( Pasande kabob). The aroma of saffron makes it a hot favourite and an important ingredient in many a classic recipes. However, different religious communities have evolved their own definitive methods and styles of cooking over the years. Muslims usually avoid asafetida and curds and Kashmiri Pandits abstain from using onions and garlic in their meals. Phirni is a popular dessert of Jammu and Kashmir.